Add an elegant and demure touch of class to every occasion. 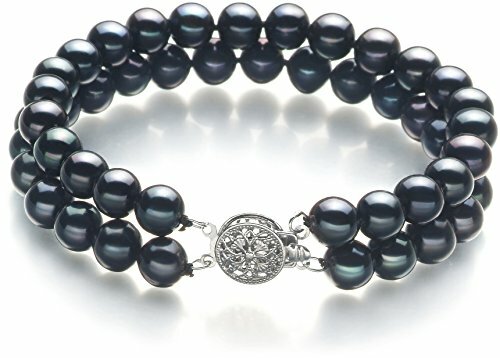 This gorgeous black bracelet is created from genuine high quality freshwater cultured pearls. Carefully grown over many years, they have been gently harvested and matched to the strictest of standards. You will adore the flexibility of the 6 to 7mm size. Perfect for both casual and formal events. This beautiful AA quality bracelet features very nice AA luster, off-round AA shape and AA body. The alloy double clasp is the perfect metal to enhance the beauty of these cultured pearls. This bracelet is carefully hand strung, using the finest silk thread. Double knots are hand-tied between each and every cultured pearl to protect the cultured pearls from rubbing against each other. Your bracelet will be carefully packed and shipped to you in an elegant jewelry box and accompanied by lots of free extras. If you choose, we would be delighted to gift wrap your purchase and turn this bracelet into an unforgettable gift. Each cultured pearl is beautifully unique and is made by a natural organism; no two cultured pearls are exactly alike. The cultured pearl color that you receive may vary slightly from that shown in the picture. Cultured pearls are playful with light, and depending on the light conditions you view them at, they will present a slightly different color - a fascinating phenomenon. We invite you to look at your cultured pearls in bright sunlight, on a cloudy day and inside your home. The change of color you will see will surprise and amaze you. We hope you enjoy the natures beauty and its unique color spectrum that cultured pearls offer. Included FREE with your cultured pearls bracelet is an Appraisal Certificate prepared by a Pearl Expert describing in detail your bracelet size, color and body shape. A color picture of your bracelet is shown on each certificate to ensure carefree insurance claims should those ever arise. It is a wonderful keepsake that shows you truly care. Create a WOW! Experience with a FREE matching gift box. Our boxes are exclusively designed for PearlsOnly to gently hold your cultured pearl bracelet during shipping and also to be breathtaking when your cultured pearl bracelet is unwrapped and opened. With a focus on detail and elegance, the overall packaging from outside wrapping to inside, creates an unforgettable opening experience. Easily care for your cultured pearls bracelet, with a FREE silky storage pouch to protect your cultured pearls bracelet when you are not wearing it. Although cultured pearls are very easy to take care off, we do include a FREE Pearl Care Card, so that you can easily know how to best take care of your cultured pearls bracelet to keeps its value and beauty.